I do believe I will be adding Jeff Walker's book LAUNCH to my canon of recommended business books. This book basically tells you how to avoid simply putting a product out there and saying “hey, consuming public, come buy my stuff”. It explains how to find the people that are interested, nurture a relationship with them, and lead them into a situation where they are eager to buy from you. My first exposure to Jeff Walker was while watching the online version of Brendon Burchard’s Expert’s Academy. Jeff was one of the speakers and it blew me away. He told his personal story, which is easy for just about anybody to connect with, the need to support a family and one’s self. Although some might say that this book is good for people who already have a business and to know what niche they are in, I believe this book is great for the entrepreneurial-minded person who does not yet know what niche they are going to pursue. Jeff Walker provides numerous examples of people who took their passion and turned it into a business that no longer required an exchange of money for time. As a reader, when I came to the example of the juggler, who had a professional scare after an injury, who succeed in making a product that no longer required him physically exchanging dollars for hours, it helped me realize that I've probably already got the experience, passion and ability to productize what is already in my head. One of my favorite things about Jeff's book is how he explains the integration of Robert Cialdini’s six weapons of influence. This book will help you with creating a list ( or leveraging the list of others) and psychologically leading them through a process to want to buy from you. For anyone using email marketing, this book is a must! For anyone not using email marketing, you need to start using email marketing now and this book is a must! If appropriate, use video. One important thing I want to mention is that Launch is self-contained. This book is not a business card to get you to buy a mega expensive product to fill in the gaps. Of course, if Jeff were to go into intricate detail of all the steps, the book would be mega huge! I'm just saying that the information in this book can be taken by a business owner or entrepreneur and used as a guide to success. 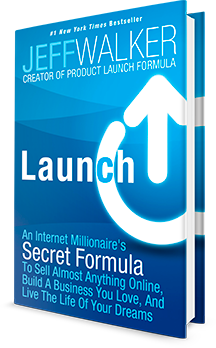 Jeff Walker does sell the Product Launch Formula, which goes into great detail on how to do absolutely everything. If you have the money to get your hands on the latest version of PLF, I do strongly recommend it. But, like I said, if you just read and implement the information in the book, it is self-contained and more than sufficient to get you far ahead of the game compared to if you had not. So read it!